“Abba, how come Nanaji does Puja while Ammi and you perform namaaz?” eight year old Muskaan asked her father Imtiaz Hussain. They were sitting in the balcony of their flat on a Sunday morning munching groundnuts – the year was 2023. “Wow! That’s great, but make it a long one,” Muskaan said snuggling up to her father. “Muskaan, you must have read in your General Knowledge book that India and Pakistan fought a war in the year 1999. Pakistani intruders had invaded Kargil and the Indian forces had beaten them back. 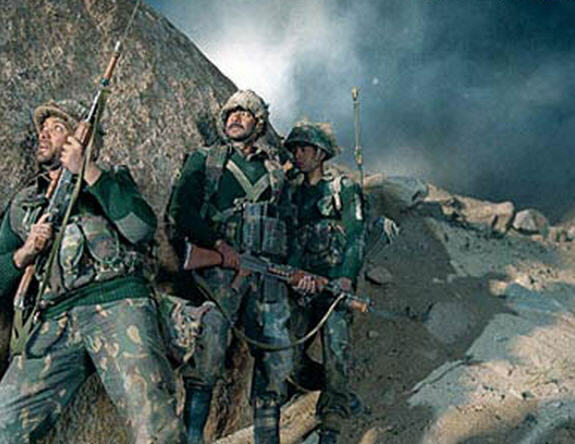 For the Indians the Kargil conflict was the toughest war they had fought since independence. The war brought to light many tales of heroism, valour, courage and compassion. One such story is that of a Major who was called Major Tiger by his colleagues because he was very brave and fearless. This tale is about him and his love for a little girl… It is a story of a father and a patriot. It was three in the morning and it was pitch dark all around. Major Tiger was leading his men up the slopes of Point 4130. This was one of the key peaks overlooking the Srinagar-Leh highway. His task was to capture it at any cost. It took the soldiers more than eight hours to inch their way up. Every few minutes a hail of bullets would greet them as the intruders, firmly entrenched on top, kept firing. When they neared the top from the east side they were ambushed by a band of enemy soldiers from the west. When caught between the firing from the top and the enemy attack from the left, Major Tiger’s men fought on bravely. They managed to beat back the attackers who had ambushed them but at a cost of twenty men. Major Tiger now had only three men with him and the intruders on top were at least twenty. He decided to take a risk. He called the artillery on his radio and asked them to shell the top, asking for the shells to land five metres from where he and his men lay. In normal circumstances this would have been considered suicidal, but the situation was by no means normal. Under the cover of the artillery fire Major Tiger and his men stormed the enemy bunkers. Taken by surprise the enemy fell like nine pins. After a pitched battle when he looked around an hour later, he found he was alone. All his men had died fighting. There seemed to be no signs of intruders too. Major Tiger’s battalion had won the peak but at a very heavy cost. As he stumbled between the corpses looking for any sign of life he noticed a movement from the corner of his eye. In a flash he turned back and was just in time to ward off a frontal attack by an enemy soldier. The attacker’s bayonet just missed slicing through Major Tiger’s left shoulder. As his adversary tried to recover his balance Major Tiger swung his rifle and caught him on the head. The soldier staggered back. The two opponents lunged at each other. His adversary’s bayonet pierced Tiger Major’s arm, while his own bayonet entered the enemy’s stomach. Major Tiger withdrew his rifle and stepped back. He didn’t want to kill the soldier. He wanted to take him alive so that later he would be able to get some information from him. “Surrender or I’ll finish you,” he shouted. “I’d rather die with dignity than surrender,” his opponent snapped back and with blood oozing out of his stomach made a desperate lunge at Major Tiger. In an instant Major Tiger lifted his rifle and shot him through the heart. As the soldier fell in a heap on the rocky ground Major Tiger couldn’t help but admire the courage of his brave adversary. Later when he returned to the base camp and the bodies of the soldiers had been brought back Major Tiger went through the papers retrieved from the bodies of the enemy. The soldier who had challenged Major Tiger and fought so bravely was Captain Ejaaz Khan. In his pocket was a letter written in a childish scrawl and a photograph of a seven year old girl. She was slim, fair and was clad in a navy blue salvar kameez. She had bright blue eyes, a small perky nose and two tiny pig tails. Major Tiger stared at the photograph mesmerised. He just couldn’t take his eyes off it. The little girl looked exactly like his own Neha – his daughter who had died at the age of six, her head in his lap. He read the letter. It was in Urdu. Having learnt it as a third language in school he could read Urdu, though with a little difficulty. This is my tenth letter to you but you have replied to only one. I hope you are getting all my letters. Abbu, I am so proud of you. None of my friends has a father in the Pakistan Army. Come back soon. I am waiting to hear how you fought the Indian soldiers and won the battle for Pakistan. Abbu, Nikhat khala was telling that in Delhi you get beautiful bangles. When you reach Delhi can you buy for me six red, four green and two blue bangles. I love you so much Abbu. For the first time in his life he felt regret for having killed an enemy soldier. A month later the hostilities ended and the dialogues between India and Pakistan resumed. Gradually Kargil disappeared from the newspapers and to most people remained only a memory. Normalcy was restored in the relationship between India and Pakistan. Cricketing ties and cultural exchange programmes resumed between the two countries. But for Major Tiger Kargil was still burning in his heart. And it would continue smouldering till he had achieved his mission. Over the last one year or so he had made desperate efforts to trace the whereabouts of Ayesha. He had contacted the Pakistan High Commissioner in India as well as the Indian Ambassador to Pakistan. After regular follow ups his wish had been fulfilled. He was to meet Ayesha in Lahore. This was the first definite step in his mission. Ayesha lived with her grandfather. Her mother had died when she was three. The door was opened by an old man of around seventy. Behind him clutching his Kurta was Ayesha. She looked much taller than she did in the photograph and prettier. But there was a certain sadness in her eyes – a reflection of the tragedy that had destroyed her life. “Yes, salaam vaalekum,” he replied in chaste Urdu. Ayesha smile shyly and did an elaborate adaab. Ayesha and Major Tiger hit it off real well. It was almost as if they had known each other for years. Major Tiger planned to stay in Lahore for a week but he stayed for a month. Every day he would visit Ayesha and the two of them would spend time talking and laughing together. Mohammed Khan had never seen her laugh so freely since her father’s death. On the day he was leaving Major Tiger made his proposal. “When the Pakistan Government official told me that you were an Indian Major and you knew my son before the Kargil war I thought you just wanted to see your friend’s daughter. If I had known you had such ideas I would never have allowed you to meet Ayesha,” Mohammed Khan shouted, his face turning red with anger. Exactly a month later, Major Tiger was once again knocking on the door of Ayesha’s house. It was opened by Ayesha. She was delighted to see him. She gave him a big hug. “Baba has gone to the Masjid. He will be back soon,” Ayesha said after they had sat down in the living room. Major Tiger’s heart was thumping. He was hoping against hope that Mohammed Khan would agree. Major Tiger was silent for some time and then spoke quietly. When Baba came Ayesha told him about Major Tiger’s proposal. Mohammed Khan seemed quite surprised. “Please Baba, please don’t say no. I want to go with Major Chacha but I can’t leave you here alone. Please agree na,” she pleaded, climbing on to his lap and putting her little arms around him. Mohammed Khan didn’t answer for some time. Shifting from Lahore to Delhi was not an easy task. But in six month’s time Ayesha and Baba were settled in Major Tiger’s house which had now become their home. Three years later Baba passed away. 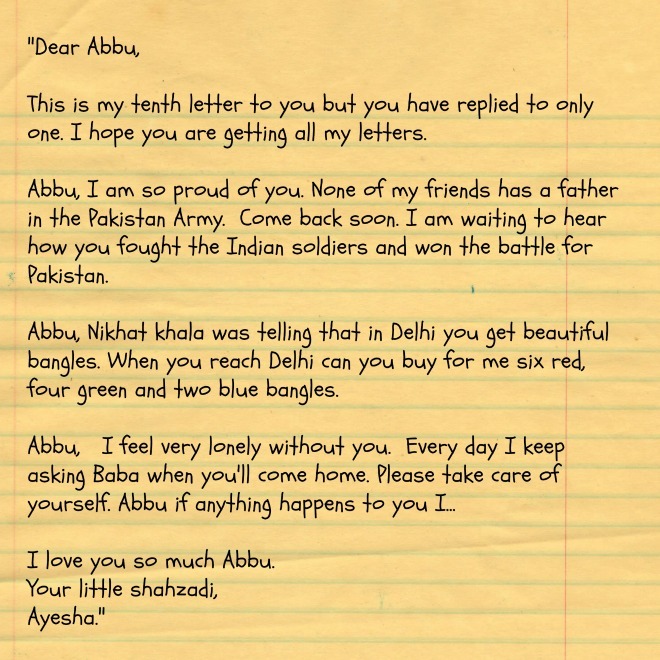 It was only when Ayesha was eighteen that Major Tiger whom she now called Major Abbu told her how her father had died. She was shocked. Her face turned white and she started screaming at him. She called him a murderer and a liar. She threw herself on her bed and cried her heart out, refusing to even eat anything. Major Tiger sat besides her patiently waiting for the shock, anger and agony to subside. Then he started slowly explaining to her. “Both Captain Ejaaz Khan and I were only doing our duty. We were strangers fighting for our respective countries. It was just a chance that he died and I survived. It could have very easily been the other way around. Gradually Ayesha got over it. She realised what Major Abbu was telling was the stark truth. She once again started treating him with the same love, respect and admiration that she used to. “Anywhere you want, little one. All roads lead to God,” Imtiaz said, picking Muskaan up and giving her a hug.